The Society of Botanical Artists's new President - Billy Showell - has today announced the new venue - and dates - for the 2019 Annual Exhibition of the Society of Botanical Artists. More details about the Call for Entries will be issued in due course. The outline details are as follows - with more comments in and below the flyer below. 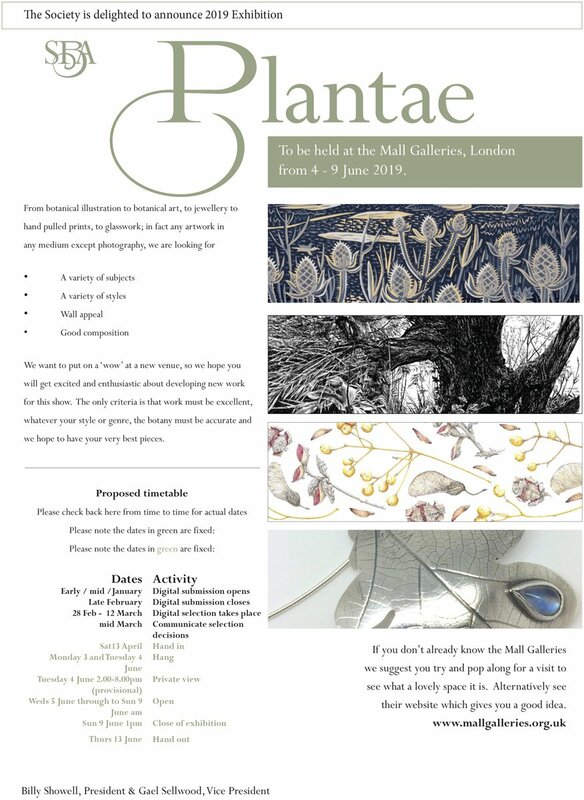 Click the image below to view a larger version of the exhibition flyer. View the new venue in the two photos at the bottom. Billy Showell and Gael Selwood who are organising the exhibition is this prestigious new venue - home of other national art societies - are very keen to make sure that artwork creates a "wow" and the exhibition creates a very good impression. The only criteria is that work must be excellent, whatever your style or genre, the botany must be accurate and we hope to have your very best pieces. Marta Chirino who co-ordinated the recent Tulipa Tulipae exhibition and associated catalogue at the Real Botanical Gardens in Madrid has made a very effective slideshow video of the sequence of how the show came about from beginning to end. It featured 87 paintings of different tulips by 47 SBA members, historical botanical illustrations of the tulip and was complemented by 20,000 tulips planted specially in the botanical garden. Tulipa Tulipae - El tulipa ilustrado (Tulipa, Tulipae - the illustated tulip) is a book about botanical art relating to tulips. It's also the catalogue (in Spanish) for an exhibition at the Real Jardín Botánico de Madrid which is all about how tulips have been represented by botanical art from the 600 years - by botanical artists past and present. Fortunately for those of us who don't read Spanish it also has an English translation at the end - which is very welcome for a book which is a jolly good read. I've learned a few things while reading it. The Real Jardín Botánico de Madrid has joined forces with the oldest botanical art society in the world, the Society of Botanical Artists to develop a comprehensive exhibition about the botanical art of tulips covering 89 different varieties. The objective of the exhibition is to show the distinct botanical aspects of the tulip - in terms of its anatomy, taxonomy and classification groups of the genus Tulipa - alongside exhibitions which demonstrate how the tulip has evolved in terms of botanical art over time. The exhibition is in the at Villanueave Pavilion in the Real Jardín Botánico de Madrid until 20 May. However the tulip paintings will live on in this book for a long time afterwards. Unusually for a catalogue of an art exhibition, Tulipa Tulipae is both comprehensive and a jolly good read - if you like botanical art history as I do. Esther García Guillén, curator of collections at the Royal Botanical Garden-CSI. In terms of the artists whose work is included, first of all I'd like to say it is wonderful to be able to see the entire exhibition from my home in London. I only have one small gripe about the book - and that is the English Translation is at the back and hence the words that go with the images are not next to them. It's OK for the most part. However I personally would have preferred to have what I think of as the Taschen version i.e. two columns of text on each page - for the two languages - and then images opposite. That's the way it works for the biographies and it would have been a really super book if it had been like that throughout. HIGHLY RECOMMENDED - for anybody who likes tulips and art history. I'm one such so for me it's just perfect! Longer term, I can only recommend that more botanical art societies do projects like this and become involved in the creation of books which record the output of their members. Exhibitions are wonderful to visit - but you can keep coming back to a favourite book.